According to legend, Bret Easton Ellis became so consumed by dark thoughts when writing American Psycho that he began to lose his sense of compassion. Considering the dark subject matter and ruthless nature of certain characters within my novels, people often ask me how I can come up with such things and if it affects me. The answer is...no, it doesn't affect me. It's a lot of fun to get into the head of a killer and imagine the world through a different set of eyes, but it's like an actor playing a role. I don't become a killer or let dark thoughts consume me. I think that we all have a darker side (myself apparently more than others), and I just tap into that part of my brain. But that's the cool (and therapeutic) thing about writing…I get to be all of the characters, good and bad, hero and villain. In fact, I'd go as far as to say that my sense of compassion for both the killers and victims has grown since writing this type of book. A lot of situations within my books stem from imagining the scariest possible scenarios for me on a personal level, from both an internal and external viewpoint. It's not what I'd like to do to someone else; it's what I would never want to happen to me. And I think that's why it resonates. 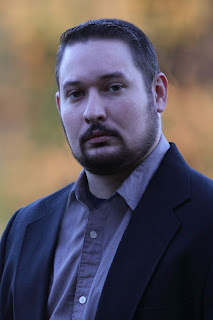 Ethan Cross is the pen name of a thriller author living and writing in Illinois with his wife, two daughters, and two Shih Tzus. An international bestselling author that other bestselling authors have compared to James Patterson and Thomas Harris, Ethan Cross‘s work is an unforgettable combination of high-intensity thrills, memorable characters, and complex scenarios. The Bookworm called his first bestseller, The Shepherd, “a thrill ride that takes off from page one,” and that’s the experience you can expect from everything Ethan Cross writes. I'll be reviewing Ethan's latest thriller, The Prophet, within the next couple of months.